本发明提供了一种具有式(I)结构的化合物，其中，R1为丙烯酸酯基；R2为异佛尔酮基、己基、甲基环己基、二环己基甲基或甲苯基；R3为叔胺基；m和n为聚合度，2≤m≤20，1≤n≤12。 The present invention provides a compound having the formula (I) configuration, wherein, Rl is an acrylate group; R2 is isophorone group, a hexyl group, a cyclohexyl methyl group, dicyclohexyl methyl or tolyl; R3 is t group; m and n is the degree of polymerization, 2≤m≤20,1≤n≤12. 本发明还提供了一种紫外光固化涂料，包括：60～80重量份的改性聚氨酯丙烯酸酯，所述改性聚氨酯丙烯酸酯具有式(I)结构；10～18重量份的水；0.3～0.9重量份的水性流平剂；5～9重量份的水性助溶剂；2～6重量份的水性蜡助剂；1.3～3重量份的水性润湿剂；0.5～0.7重量份的水性消泡剂；3～5重量份的光引发剂。 The present invention further provides a UV-curable coatings, comprising: 60 to 80 parts by weight of a modified urethane acrylate, urethane-modified acrylate having the formula (I) structure; 10 to 18 parts by weight of water; 0.3 ~ 0.9 parts by weight of an aqueous leveling agent; from 5 to 9 parts by weight of an aqueous co-solvent; from 2 to 6 parts by weight of an aqueous wax additives; 1.3 to 3 parts by weight of the aqueous wetting agent; 0.5 to 0.7 parts by weight of a defoaming aqueous agent; 3 to 5 parts by weight of a photoinitiator. 本发明提供的紫外光固化涂料不仅具有优异的耐指纹性能、防腐蚀性能和耐候性能，还能够快速固化。 The present invention provides UV-curable coatings not only excellent anti-fingerprint property, corrosion resistance and weather resistance, fast curing is also possible. 本发明涉及涂料技术领域，尤其涉及一种改性聚氨酯丙烯酸酯及紫外光固化涂料。  The present invention relates to coating technology, and in particular relates to a modified polyurethane acrylate and UV curable coatings. 背景技术 耐指纹研究源于日本，最初目的是满足家电领域的需要，因为在家电生产过程中，许多部件需要经工人多次触摸，工人手上的汗溃会在零件表面形成污染，影响制品的美观。  Study of anti-fingerprint from Japan, was originally designed to meet the needs of field of home appliances, since the household appliance manufacturing process, many parts require multiple workers by touch, the hands of workers sweat contamination crushed form part surface, affect the appearance of the article. 而随着社会的发展，耐指纹性能不仅是家电行业的一项重要指标，也是汽车、办公用品行业的重要指标。 With the development of society, fingerprint-resistant performance is not only an important indicator of household appliances industry, as well as automobile, an important indicator of the office supplies industry. 家电、汽车或办公用品的耐指纹一般是通过在其表面涂覆耐指纹涂料实现的。  appliances, office supplies, automobiles, or fingerprint resistance are typically achieved by coating the surface thereof fingerprint resistant coating. 目前，应用较为广泛的耐指纹涂料多为单组分水性涂料，如申请号为94112200. X的中国专利公开了一种耐指纹钢板的生产方法，主要是将添加有机硅溶胶、成膜助剂、链烷烃水化物和防霉剂的聚丙烯酸酯涂料涂覆在钢板上，经自然固化后得到了耐指纹性能良好的钢板，但该涂料的耐腐蚀性较差，仅为72小时；申请号为200710131837. X的中国专利文献公开了一种含有水性聚氨酯树脂、二氧化硅溶胶、水性聚四氟乙烯蜡浆、去离子水、润湿剂、乙二醇和消泡剂的无铬耐指纹涂料，该涂料具有良好的耐指纹性能，而且涂装后无需固化，但是耐腐蚀性也较差，仅为80小时左右。 Currently, fingerprint resistance is widely used as one-component multi-coating an aqueous coating, such as Chinese Patent Application No. 94112200. X discloses a method of producing a fingerprint-resistant steel sheet, mainly by adding an organic sol, coalescents paraffins and hydrates fungicide polyacrylate coating is applied on the steel sheet, obtained after curing a good natural fingerprint resistant steel sheet properties, but poor corrosion resistance of the coating, only 72 hours; application No. as disclosed in Chinese Patent Document 200710131837. X containing an aqueous polyurethane resin, silica sol, an aqueous polytetrafluoroethylene wax slurry, deionized water, a wetting agent, ethylene glycol and defoamer fingerprint resistant chromium-free coating the coating has good anti-fingerprint property, but also after coating without curing, but the corrosion resistance is poor, only about 80 hours. 为了提高耐指纹涂料的防腐蚀性能，现有技术公开了包含双组份水性树脂的耐指纹涂料，如申请号为200810202325. 2的中国专利文献公开了一种包含组分A和组分B的防腐蚀耐指纹漆，其中，组分A是以水性环氧树脂为基体树脂，添加了纳米二氧化硅、硅烷偶联剂、锆化物、去离子水、微晶蜡分散液、消泡剂和流平剂的组合物；组分B是水性环氧改性胺固化剂与环氧固化促进剂形成的组合物，两个组分共同发挥作用使涂料既具有良好的耐指纹性能又具有良好的防腐蚀性能。  In order to improve the fingerprint resistance of the anti-corrosion coating, the prior art discloses a fingerprint-resistant coating comprises an aqueous two-component resin, such as Chinese patent application No. 200810202325.2 discloses a composition comprising component A and component B fingerprint corrosion resistant paint, wherein component a is a water-based epoxy resin as matrix resin, is added a nano silica, a silane coupling agent, a zirconium compound, deionized water, a microcrystalline wax dispersion, elimination the composition of the foam stabilizer and leveling agent; component B is an aqueous composition of an epoxy-modified amine curing agent and the epoxy curing accelerator is formed, so that the two components function together both good coating properties and resistance to fingerprints It has good corrosion resistance. 但是，该涂料应用时，需要首先将组分A和组分B搅拌混合，涂覆于金属薄板后还需要经过低温烘烤才能固化，完全固化需要的时间较长，不能满足快速流水线涂装的需求。 However, the coating application, the need to first component A and component B mixed with stirring, the coated metal sheet through low-temperature baking need to cure, the longer time required for curing fully, can not meet the fast line coating demand. 有鉴于此，本发明所要解决的技术问题在于提供一种改性聚氨酯丙烯酸酯及紫外光固化涂料，本发明提供的紫外光固化涂料不仅具有优异的耐指纹性能和防腐蚀性能，还能够在紫外光的照射下快速固化，满足快速流水线涂装的需求。  Accordingly, the present invention is to solve the technical problem is to provide a modified polyurethane acrylate and UV curable coatings, the present invention provides UV-curable coatings having not only excellent corrosion resistance and fingerprint properties, further can be quickly cured by irradiation with ultraviolet light, cope with a fast pipeline coating. m和η为聚合度，2≤m≤20，I≤η≤12。  m and η is the degree of polymerization, 2≤m≤20, I≤η≤12. 3〜5重量份的光引发剂。  3 to 5 parts by weight of a photoinitiator. 40°C〜45°C时向所述第二中间产物中加入中和剂，搅拌中和后除去丁酮，得到改性聚氨酯丙烯酸酯。 When  40 ° C~45 ° C was added a neutralizing agent to the second intermediate product, after removal of methyl ethyl ketone and stirring, to obtain a modified urethane acrylate. 优选的，所述二异氰酸酯为异佛尔酮二异氰酸酯、六亚甲基二异氰酸酯、甲基环己基二异氰酸酯、二环己基甲烷二异氰酸酯或甲苯二异氰酸酯。  Preferably, the diisocyanate is isophorone diisocyanate, hexamethylene diisocyanate, methylcyclohexyl diisocyanate, dicyclohexylmethane diisocyanate or toluene diisocyanate. 优选的，所述羟基丙烯酸酯单体为甲基丙烯酸羟乙酯、季戊四醇三丙烯酸酯或丙烯酸羟丙酯。  Preferably, the hydroxy-acrylate monomer is hydroxyethyl methacrylate, pentaerythritol triacrylate or hydroxypropyl acrylate. 优选的，所述中和剂为三乙胺、二甲基乙醇胺、三乙醇胺或二乙醇胺。  Preferably, the neutralizing agent is triethylamine, dimethylethanolamine, triethanolamine or diethanolamine. 优选的，所述水性流平剂为丙烯酸酯类流平剂或有机硅类流平剂。  Preferably, the leveling agent is an aqueous acrylate-based leveling agent or a silicone-based leveling agent. 优选的，所述水性助溶剂为异丙醇、乙二醇丁醚、二乙二醇丁醚、丙二醇丁醚、二丙二醇丁醚和丙二醇甲醚中的一种或多种。  Preferably, the aqueous co-solvent is isopropanol, ethylene glycol butyl ether, diethylene glycol butyl ether, propylene glycol butyl ether, dipropylene glycol butyl ether and propylene glycol methyl ether of one or more. 优选的，所述光引发剂为I-羟基-环己烷基-苯基酮、2-羟基-甲基苯基丙烷-I-酮、2-甲基-2-(4-吗啉基）-1-[4-(甲硫基）苯基]-I-丙酮、2，4，6_三甲基苯甲酰基-二苯基氧化膦、2，4，6_三甲基苯甲酰基苯基膦酸乙酯、2-二甲氨基-2-苄基-l-[4-(4-吗啉基）苯基]-I-丁酮、2-羟基-2-甲基-l-[4-(2-羟基乙氧基）苯基]-I-丙酮或苯甲酰甲酸甲酯。  Preferably, the photoinitiator is I- hydroxy - cyclohexyl - phenyl ketone, 2-hydroxy - propane -I- methylphenyl, 2-methyl-2- (4-morpholine morpholine-yl) -1- [4- (methylthio) phenyl] -I- acetone, 2,4,6_ trimethyl benzoyl - diphenyl phosphine oxide, trimethyl 2,4,6_ benzoylphenyl acid ethyl ester, 2-benzyl-2-dimethylamino--l- [4- (4- morpholinyl) phenyl] -I--butanone, 2-hydroxy-2-methyl -l- [4- (2- hydroxyethoxy) phenyl] -I- benzoyl acetone or methyl. 与现有技术相比，本发明以环氧树脂和Y-环氧丙氧基丙基三甲氧基硅烷为改性齐U，在聚氨酯丙烯酸酯的主链上引入环氧树脂基团和Y-环氧丙氧基丙基三甲氧基硅烷基团，丙烯酸酯具有较好的耐候性；环氧树脂具有良好的防腐蚀性能；有机硅具有良好的耐指纹性能和抗污性能，因此，得到的改性聚氨酯丙烯酸酯具有优异的耐指纹性能、抗污性、防腐蚀性能和耐候性能。  Compared with the prior art, the present invention is an epoxy resin and Y- glycidoxypropyl trimethoxysilane a modified homogeneous U, introduction of epoxy groups in the main chain of the urethane acrylate and Y- glycidoxy propyl trimethoxy silane groups, acrylate has good weather resistance; epoxy resin having a good corrosion resistance; silicone has good stain resistance and fingerprint-resistant properties, so , obtained modified urethane acrylate having an excellent anti-fingerprint property, stain resistance, corrosion resistance and weather resistance. 以改性后的聚氨酯丙烯酸酯作为成膜物质，添加水性流平剂、水性助溶剂、水性蜡助剂、水性润湿剂、水性消泡剂和光引发剂等助剂后得到紫外光固化涂料。 In the modified urethane acrylate as the film-forming material, a leveling agent was added aqueous, aqueous co-solvents, aqueous wax additives, water wetting agents, defoamers and aqueous photoinitiator auxiliary agents obtained after UV-curable coatings. 本发明提供的紫外光固化涂料不仅具有优异的耐指纹性能、防腐蚀性能和耐候性能，还能够快速固化，涂覆于板材表面后得到的漆膜无需烘烤，在紫外光的照射下即可以15m/min〜25m/min的速度固化,能够满足快速流水线涂装的需要。 The present invention provides UV-curable coatings not only excellent anti-fingerprint property, corrosion resistance and weather resistance, fast curing can also be coated on the rear surface of the board is obtained without baking the film, i.e., UV irradiation may be speed 15m / min~25m / min of curing quickly to meet the needs of a pipeline coating. 图I为本发明实施例提供的改性聚氨酯丙烯酸酯的核磁共振氢谱图。  FIG. I H NMR spectrum of the present invention, modified polyurethane acrylates according to an embodiment. m和η为聚合度，2彡m彡20，I彡η彡12。  m and η is the degree of polymerization, m 2 San San 20, I 12 San San η. 具有式（I)结构的化合物是由环氧树脂和Y -环氧丙氧基丙基三甲氧基硅烷改性的聚氨酯丙烯酸酯，具有优异的耐指纹性能、抗污性、防腐蚀性能和耐候性能。  compound having the structure of formula (I) is an epoxy resin, and Y - trimethoxysilane glycidoxypropyltrimethoxysilane modified urethane acrylate, have excellent anti-fingerprint property, stain resistance, anti-corrosion performance and weather resistance. 下条件：2彡m彡5 ;1彡η彡12，η优选满足以下条件：1彡η彡10，更优选满足以下条件：K η < 5。 Conditions: 2 San San 5 m; [eta] 1 San San 12, η ​​is preferable to satisfy the following conditions: [eta] 1 San San 10, more preferably satisfies the following condition: K η <5. 本发明以环氧树脂和Y-环氧丙氧基丙基三甲氧基硅烷为改性剂，以二月桂酸二丁基锡为催化剂、二异氰酸酯为交联剂，与羟基丙烯酸酯聚合物在丁酮中进行反应，得到环氧树脂和Y-环氧丙氧基丙基三甲氧基硅烷改性的聚氨酯丙烯酸酯。  In the present invention, an epoxy resin and Y- glycidoxypropyl trimethoxysilane as modifier, to dibutyl tin dilaurate as a catalyst, a diisocyanate as crosslinking agent, the hydroxy acrylate polymer They reacted in methyl ethyl ketone to obtain an epoxy resin-modified silane and glycidoxypropyl Y- urethane acrylate. 向所述反应混合物中滴加过氧化苯甲酰溶液，保温反应3h〜5h，得到羟基丙烯酸酯聚合物。  To the reaction mixture was added dropwise a solution of benzoyl peroxide, the reaction was kept 3h~5h, to give hydroxy acrylate polymer. 按照本发明，所述甲基丙烯酸、丙烯酸羟乙酯、甲基丙烯酸甲酯、甲基丙烯酸环氧丙酯、过氧化苯甲酰和十二烷基硫醇的质量比优选为26〜105 ： 29〜143 ： 23〜126 ： 36 〜175 ： 2. I 〜5. 8 ： O. 3 〜I. 6，更优选为30 〜80 ： 35 〜120 ： 30 〜110 ： 45 〜140 ： 2. 5 〜4. 5 ： O. 5 〜I. 2。  According to the present invention, the methacrylic acid, hydroxyethyl acrylate, methyl methacrylate, glycidyl methacrylate, benzoyl peroxide and dodecyl mercaptan mass is preferably from 26 ~105: 29~143: 23~126: 36 ~175:. 2. I ~5 8:. O. 3 ~I 6, more preferably 30 ~ 80: 35 ~ 120: 30 ~110: 45 ~140: . 2. 5 ~4 5: O. 5 ~I 2..
 将所述羟基丙烯酸酯聚合物、Y-环氧丙氧基丙基三甲氧基硅烷、丁酮、环氧树脂和二月桂酸二丁基锡混合后，升温至75°C〜80°C，加入二异氰酸酯，在二异氰酸酯的作用下，羟基丙烯酸酯聚合物生成聚氨酯丙烯酸酯，并将Y-环氧丙氧基丙基三甲氧基硅烷和环氧树脂被引入主链结构中，得到第一中间产物。  The hydroxy acrylate polymer, Y- glycidoxypropyl trimethoxysilane, methylethyl ketone, epoxy resin, dibutyl tin dilaurate were mixed and warmed to 75 ° C~80 ° C , the diisocyanate was added, under the action of a diisocyanate, a hydroxy acrylate polymer to form a polyurethane acrylate, and Y- glycidoxypropyl trimethoxy silane and an epoxy resin is introduced into the main chain structure, to obtain a first an intermediate product. 生成第一中间产物的反应时间优选为3h〜7h，更优选为3h〜5h。 Generating a first intermediate product reaction time is preferably 3h~7h, more preferably 3h~5h. 所述羟基丙烯酸酯聚合物、Y-环氧丙氧基丙基三甲氧基硅烷、丁酮、环氧树脂、二月桂酸二丁基锡和二异氰酸酯的质量比优选为60〜200 ： 58〜281 ： 150 〜480 ： 62 〜580 ： O. 4 〜2. I ： 168 〜653，更优选为80 〜120 ： 100 〜200 ： 180 〜450 ： 80 〜550 ： O. 8 〜I. 5 ： 215 〜550。 The hydroxy acrylate polymer, Y- mass glycidoxypropyl trimethoxysilane, methyl ethyl ketone, epoxy resin, dibutyl tin dilaurate and diisocyanate ratio is preferably 60~200: 58~281: 150 ~480: 62 ~580: O. 4 ~2 I:. 168 ~653, more preferably 80 ~120: 100 ~200: 180 ~450: 80 ~550: O. 8 ~I 5:. 215 ~550 . 按照本发明，所述环氧树脂优选为双酚A环氧树脂，可以为E-51型、E-44型、E_31型、E-20型、E12型或E06型；所述二异氰酸酯优选为异佛尔酮二异氰酸酯、六亚甲基二异氰酸酯、甲基环己基二异氰酸酯、二环己基甲烷二异氰酸酯或甲苯二异氰酸酯，更优选为异佛尔酮二异氰酸酯、六亚甲基二异氰酸酯或甲苯二异氰酸酯。  According to the present invention, the epoxy resin preferably is a bisphenol A epoxy resin, may be a model E-51, E-44 type, E_31 type, E-20 type, E12 type or E06 type; the two isocyanates preferably isophorone diisocyanate, hexamethylene diisocyanate, methylcyclohexyl diisocyanate, dicyclohexylmethane diisocyanate or toluene diisocyanate, more preferably isophorone diisocyanate, hexamethylene isocyanate or tolylene diisocyanate. 得到第一中间产物后，向所述第一中间产物中加入羟基丙烯酸酯单体和对羟基苯甲醚，继续反应，得到第二中间产物。 After  to give a first intermediate product, added to the first intermediate product and a hydroxy acrylate monomer hydroxy anisole, the reaction was continued to give a second intermediate product. 羟基丙烯酸酯单体与第二中间产物发生反应，得到端基含有不饱和键的第二中间产物。 Hydroxy acrylate monomer reacts with the second intermediate product, to give a second intermediate product end group containing an unsaturated bond. 按照本发明，生成第二中间产物的反应时间优选为3h〜7h，更优选为3h〜5h。 According to the present invention, generating a second intermediate product of reaction time is preferably 3h~7h, more preferably 3h~5h. 所述羟基丙烯酸酯单体优选为甲基丙烯酸羟乙酯、季戊四醇三丙烯酸酯或丙烯酸羟丙酯。 The hydroxy acrylate monomer preferably hydroxyethyl methacrylate, pentaerythritol triacrylate or methacrylate, hydroxypropyl acrylate is. 按照本发明，所述羟基丙烯酸酯单体、对羟基苯甲醚与二异氰酸酯的质量比为67〜318 ： O. 35〜I. 9 ： 168〜653。 According to the present invention, the hydroxy-acrylate monomer, and the quality hydroxyanisole diisocyanate ratio of 67~318:. O. 35~I 9: 168~653. 得到第二中间产物后，将体系降温至40°C〜45°C后，向所述第二中间产物中加入中和剂，搅拌反应后除去丁酮，得到改性聚氨酯丙烯酸酯。 After  to give a second intermediate product, cooling the system to 40 ° C~45 ° C, the neutralizing agent is added to the second intermediate product, the reaction mixture was stirred butanone was removed to obtain a modified urethane acrylate. 所述中和剂为叔胺，优选为三乙胺、二甲基乙醇胺、三乙醇胺或二乙醇胺。 The neutralizing agent is a tertiary amine, preferably triethylamine, dimethylethanolamine, triethanolamine or diethanolamine. 所述中和剂与所述Y-环氧丙氧基丙基三甲氧基硅烷的质量比优选为26〜98 ： 58〜281，更优选为40〜80 ： 70〜200，最优选为50〜70 ： 100〜150。 The mass of the neutralizing agent Y- glycidoxypropyl trimethoxy silane is preferably from 26~98: 58~281, more preferably 40~80: 70~200, and most preferably 50~ 70: 100~150. 所述搅拌反应的时间优选为20min〜30min，更优选为23min〜28min。 The reaction time is preferably stirred 20min~30min, more preferably 23min~28min. 除去丁酮的方法优选为减压除去丁酮。 The method is preferably removed butanone butanone was removed under reduced pressure. 本发明提供的改性聚氨酯丙烯酸酯在丙烯酸酯主链上引入了环氧树脂和有机硅，其中，丙烯酸酯具有较好的耐候性；环氧树脂具有良好的防腐蚀性能；有机硅具有良好的耐指纹性能和抗污性能，因此，得到的改性聚氨酯丙烯酸具有良好的耐候性、防腐蚀性能、耐指纹性能和抗污性能。  The modified polyurethane acrylates according to the present invention is provided on an acrylate and an epoxy resin main chain introduces a silicone, wherein the acrylate has good weather resistance; epoxy resin having a good corrosion resistance; Silicone good stain resistance and fingerprint-resistant properties, and therefore, the resulting acrylic modified polyurethane has good weather resistance, corrosion resistance, fingerprint resistance and stain resistance properties. 在本发明提供的紫外光固化涂料中，上述技术方案所述的、具有式（I)结构的改性聚氨酯丙烯酸酯作为成膜物质，使得到的紫外光固化涂料具有良好的耐候性、防腐蚀性能、耐指纹性能和抗污性能。  UV-curable coating material of the present invention provides, according to the above aspect, having the formula (I) modified polyurethane acrylate structure as a film-forming substance, UV-curable coatings so obtained has excellent weatherability , corrosion resistance, fingerprint resistance and stain resistance properties. 所述改性聚氨酯丙烯酸酯的含量为60〜80重量份，优选为65〜75重量份，更优选为68〜73重量份。 The content of the modified polyurethane acrylate is 60~80 parts by weight, preferably 65~75 parts by weight, more preferably 68~73 parts by weight. 所述紫外光固化涂料还包括水，所述水优选为去离子水。  The UV-curable coating further comprises water, the water is preferably deionized water. 所述水的含量为10〜18重量份，优选为12〜16重量份。 The content of water is 10~18 parts by weight, preferably 12~16 parts by weight. 所述紫外光固化涂料还包括水性流平剂，所述水性流平剂的作用是使涂料在成膜的过程中形成平整、光滑、均匀的膜。  The UV-curable aqueous coating material further comprises a leveling agent, a leveling agent aqueous role is to smooth the coating formed during deposition, a smooth, uniform film. 所述水性流平剂优选为丙烯酸酯类流平剂或有机硅类流平剂，更优选为BYK公司生产的型号为BYK-381或BYK-345的一种或两种。 The leveling agent is preferably aqueous acrylic leveling agent or a silicone-based leveling agent, more preferably a model produced by BYK one or two or BYK-381 of BYK-345. 所述水性流平剂的含量为O. 3〜O. 9重量份，更优选为O. 5〜O. 7重量份。 The content of the leveling agent for aqueous O. 3~O. 9 parts by weight, more preferably O. 5~O. 7 parts by weight. 为了使得到的涂料更为均一稳定，本发明提供的紫外光固化涂料还包括水性助溶齐U。  In order to obtain a more uniform and stable coating, the present invention provides a UV-curable aqueous coating material further comprises a solubilizing flush U. 所述水性助溶剂优选为异丙醇、乙二醇丁醚、二乙二醇丁醚、丙二醇丁醚、二丙二醇丁醚和丙二醇甲醚中的一种或多种，更优选为异丙醇、乙二醇丁醚或二乙二醇丁醚。 The co-solvent is preferably aqueous isopropanol, ethylene glycol butyl ether, diethylene glycol butyl ether, propylene glycol butyl ether, dipropylene glycol butyl ether and propylene glycol methyl ether of one or more, more preferably isopropanol , ethylene glycol butyl ether or diethylene glycol butyl ether. 所述水性助溶剂的含量为5〜9重量份,优选为6〜8重量份。 Content of the aqueous cosolvent 5~9 parts by weight, preferably 6 ~ 8 parts by weight. 本发明提供的紫外光固化涂料还含有水性蜡助剂，所述水性蜡助剂具有耐擦伤、耐磨损、防粘连、抗结块等作用，能够改善涂料表面性能。  The present invention further provides a UV-curable coatings containing an aqueous wax additive, the aqueous wax additive having scratch resistance, wear resistance, anti-blocking, anti-caking effect, it is possible to improve the surface properties of the coating. 本发明对所述水性蜡助剂没有特殊限制，优选为德国Keim-Additec公司生产的型号为Ultralube E-810、UltralubeE-8046S,Ultralube MD-2000和Ultralube MD-2030的水性蜡助剂中的一种或多种。 The present invention is not particularly limited to the aqueous wax additive, preferably Germany Keim-Additec produced model Ultralube E-810, UltralubeE-8046S, aqueous wax additives Ultralube MD-2000 and Ultralube MD-2030 in a or more. 所述水性蜡助剂的含量为2〜6重量份，优选为3〜5重量份。 The content of the aqueous wax additive is 2 ~ 6 parts by weight, preferably 3 to 5 parts by weight. 本发明提供的紫外光固化剂涂料中还含有水性润湿剂，所述水性润湿剂的含量为I. 3〜3重量份，优选为2〜2. 5重量份。 UV-curable coating agent provided herein  The present further contains an aqueous wetting agent, the wetting agent content of the aqueous was I. 3~3 parts by weight, preferably 2~2. 5 parts by weight. 本发明对所述水性润湿剂没有特殊限制，优选为BYK公司生产的型号为BYK-307、BYK-333、BYK-377、BYK-UV3530的水性润湿剂中的一种或多种。 The present invention is not particularly limited to the aqueous wetting agent, preferably a model produced by BYK one or more of BYK-307, BYK-333, BYK-377, BYK-UV3530 aqueous wetting agent. 为了使所述紫外光固化剂涂料具有更好的性质，本发明提供的紫外光固化剂涂料中还含有水性消泡剂，所述水性消泡剂的含量为O. 5〜O. 7重量份。  In order to make the UV-curable coating agent having better properties, UV-curable coating agent provided by the present invention further contains an aqueous defoaming agent, antifoaming agent content of the aqueous is O. 5~O. 7 parts by weight. 本发明对所述水性消泡剂没有特殊限制，优选为BYK公司生产的型号为BYK-019、BYK-020和BYK-1730的水性消泡剂中的一种或多种。 The present invention is not particularly limited to the aqueous defoaming agent, preferably a model produced by BYK one or more aqueous defoamer BYK-019, BYK-020 and BYK-1730 in. 本发明提供的紫外光固化剂涂料还包括光引发剂，在所述光引发剂的作用下，所述紫外光固化涂料接受紫外光照射后才能够迅速固化。  UV-curable coating agent provided by the present invention further comprises a photoinitiator role in the photoinitiator in the UV-curable coatings after UV irradiation can be accepted quickly cured. 所述光引发剂的含量为3〜5重量份，更优选为3. 5〜4. 5重量份。 The content of the photoinitiator is 3 to 5 parts by weight, more preferably 3. 5~4. 5 parts by weight. 所述光引发剂优选为I-羟基-环己烷基-苯基酮、2-羟基-甲基苯基丙烷-I-酮、2-甲基-2-(4-吗啉基）-1-[4-(甲硫基）苯基]-I-丙酮、2，4，6_三甲基苯甲酰基-二苯基氧化膦、2，4，6_三甲基苯甲酰基苯基膦酸乙酯、2-二甲氨基-2-苄基-l-[4-(4-吗啉基）苯基]-I- 丁酮、2-羟基-2-甲基-l-[4-(2-羟基乙氧基）苯基]-I-丙酮或苯甲酰甲酸甲酯，更优选为瑞士汽巴公司生产的型号为IrfaCUrel84、Darocure 1173、Irfacure 2959 或Irfacure 819 的光引发剂。 The photoinitiator is preferably I- hydroxy - cyclohexyl - phenyl ketone, 2-hydroxy - propane -I- methylphenyl, 2-methyl-2- (4-morpholinyl) -1 - [4- (methylthio) phenyl] -I- acetone, 2,4,6_ trimethyl benzoyl - diphenyl phosphine oxide, trimethyl benzoyl phenyl 2,4,6_ acid ethyl ester, 2-benzyl-2-dimethylamino--l- [4- (4- morpholinyl) phenyl] -I--butanone, 2-hydroxy-2-methyl -l- [4 - (2-hydroxyethoxy) phenyl] -I- benzoyl acetone or methyl, more preferably produced by Ciba model IrfaCUrel84, Darocure 1173, or light Irfacure 2959 Irfacure 819 initiator. 将所述第一混合物与所述第二混合物混合，以600rpm〜IOOOrpm的转速搅拌IOmin〜20min后,得到紫外光固化涂料。  The first mixture with the second mixture, stirring at a rotational speed 600rpm~IOOOrpm IOmin~20min obtained after UV-curable coatings. 本发明优选将所述紫外光固化涂料过180目〜220目的滤网，使得到的紫外光固化涂料形态均一、性质稳定。  The present invention is preferably UV-curable coatings through 180 mesh screen ~220 mesh, UV-curable coatings so obtained form a uniform, stable. 得到紫外光固化涂料后，将其涂覆在产品表面，经紫外光照射，即可快速固化。  UV-curable coatings obtained after the coated product surface, irradiated with UV light to quickly cure. 在紫外光照射的过程中，所述光引发剂接受辐射使所述涂料快速固化。 During the ultraviolet irradiation, the photoinitiator is exposed to radiation so that rapid curing of the coating. 按照本发明，所述固化的速度可以为15m/min〜25m/min。 According to the present invention, the cure rate may be 15m / min~25m / min. 对所述紫外光固化涂料形成的漆膜进行性能测试，其具有良好的附着力、柔韧性、耐指纹性、抗污性、抗老化性、耐水性和抗腐蚀性。  The performance test of the film formed of UV-curable coatings, which has good adhesion, flexibility, fingerprint resistance, stain resistance, aging resistance, water resistance and corrosion resistance. 为了进一步说明本发明，下面结合实施例对本发明提供的改性聚氨酯丙烯酸酯及紫外光固化涂料进行详细描述。  In order to further illustrate the present invention, in conjunction with the following embodiments and modified urethane acrylate UV-curable coating material of the embodiment of the present invention provides be described in detail. 在干燥氮气保护下，向上述羟基丙烯酸酯聚合物中加入150g 丁酮、62gE44型双酚A环氧树脂、58g Y -环氧丙氧基丙基三甲氧基硅烷和O. 4g 二月桂酸二丁基锡，升温至75°C后加入168g异佛尔酮二异氰酸酯，反应3h后，向反应混合物中加入67g甲基丙烯酸羟乙酯和O. 35g对羟基苯甲醚，继续反应3h后，将反应物料降温至40°C加入26g三乙胺，搅拌20min后，减压除去丁酮，得到改性聚氨酯丙烯酸酯。  under dry nitrogen, was added 150g methyl ethyl ketone, 62gE44 bisphenol A epoxy resin to the hydroxyl acrylic polymer, 58g Y - glycidoxypropyl trimethoxysilane and two O. 4g after dibutyltin dilaurate, was heated to 75 ° C was added 168g of isophorone diisocyanate, after 3h the reaction, 67g of hydroxyethyl methacrylate was added and O. 35g hydroxy anisole to the reaction mixture, the reaction was continued 3h , the reaction mass was cooled to 40 ° C were added 26g of triethylamine, stirring for 20min, methyl ethyl ketone was removed under reduced pressure to obtain a modified urethane acrylate. 4. 09ppm、4. 20ppm、4. 35ppm、4. 41ppm、4. 64ppm、4. 72ppm、4. 88ppm、6. 69ppm、7. 02ppm。 4. 09ppm, 4. 20ppm, 4. 35ppm, 4. 41ppm, 4. 64ppm, 4. 72ppm, 4. 88ppm, 6. 69ppm, 7. 02ppm. 由此可见，所述改性聚氨酯丙烯酸酯为具有式（I)结构的改性聚氨酯丙烯酸酯，其中，R1为甲基丙烯酸乙酯基，R2为异佛尔酮基，R3为三乙胺基，η = 1，m = 3。 Thus, the modified polyurethane acrylate modified polyurethane acrylates (I) having the structure of formula, wherein, Rl is methyl methacrylate, ethyl group, R2 is isophorone group, R3 is triethylamino , η = 1, m = 3. 在干燥氮气保护下，向上述羟基丙烯酸酯聚合物中加入320g 丁酮、162gE31型双酚A环氧树脂、106g Y -环氧丙氧基丙基三甲氧基硅烷和O. 7g 二月桂酸二丁基锡，升温至80°C后加入261g2，4-甲苯二异氰酸酯，反应5h后，向反应混合物中加入305g季戊四醇三丙烯酸酯和I. 8g对羟基苯甲醚，继续反应5h后，将反应物料降温至45°C加入60g三乙醇胺，搅拌25min后，减压除去丁酮，得到改性聚氨酯丙烯酸酯。  under dry nitrogen, was added 320g methyl ethyl ketone, 162gE31 bisphenol A epoxy resin to the hydroxyl acrylic polymer, 106g Y - glycidoxypropyl trimethoxy silane and O. 7g two dibutyltin dilaurate, the temperature was raised to 80 ° C was added 261g2,4- tolylene diisocyanate, 5h after the reaction, 305g of pentaerythritol triacrylate and I. 8g hydroxy anisole, the reaction was continued 5h added to the reaction mixture, the reaction mass was cooled to 45 ° C was added 60g triethanolamine, stirred 25min, methyl ethyl ketone was removed under reduced pressure to obtain a modified urethane acrylate. 1. 83ppm、I. 97ppm、2. 21ppm、2. 36ppm、2. 49 〜2. 67ppm、3. 04ppm、3. 15ppm、3. 32 〜3. 70ppm、4. 09ppm、4. 20ppm、4. 38ppm、4. 42ppm、4. 60ppm、5. 58ppm、5. 97ppm、6. 18ppm、6. 47ppm、6. 98ppm、7. 31ppm。 1. 83ppm, I. 97ppm, 2. 21ppm, 2. 36ppm, 2. 49 ~2. 67ppm, 3. 04ppm, 3. 15ppm, 3. 32 ~3. 70ppm, 4. 09ppm, 4. 20ppm, 4. 38ppm, 4. 42ppm, 4. 60ppm, 5. 58ppm, 5. 97ppm, 6. 18ppm, 6. 47ppm, 6. 98ppm, 7. 31ppm. 由此可见，所述改性聚氨酯丙烯酸酯为具有式（I)结构的改性聚氨酯丙烯酸酯，其中，R1为季戊四醇三丙烯酸酯基，R2为甲苯基，R3为三乙醇胺基，η = 3，m = 3。 Thus, the modified urethane acrylate having an acrylate modified polyurethane of formula (I) configuration, wherein, Rl is pentaerythritol triacrylate group, R2 is a tolyl group, R3 is a triethanolamine group, η = 3, m = 3. 在干燥氮气保护下，向上述羟基丙烯酸酯聚合物中加入400g 丁酮、580gE12型双酚A环氧树脂、208g Y -环氧丙氧基丙基三甲氧基硅烷和I. 3g 二月桂酸二丁基锡，升温至78 C后加入445g /K亚甲基_■异氰ife酷，反应4h后，向反应混合物中加入230g丙稀酸轻丙酯和I. Og对羟基苯甲醚，继续反应4h后，将反应物料降温至43°C加入69g 二甲基乙醇胺， 搅拌23min后，减压除去丁酮，得到改性聚氨酯丙烯酸酯。  under dry nitrogen, was added 400g methyl ethyl ketone, 580gE12 bisphenol A type epoxy resin, 208g Y to the hydroxyl acrylic polymer - glycidoxypropyl trimethoxy silane and I. 3g two dibutyltin dilaurate, the temperature was raised to 78 C was added 445g / K methylene _ ■ isocyanurate ife cool, after 4h of the reaction, 230g of acrylic ester and I. Og light hydroxy anisole to the reaction mixture, after the reaction was continued for 4h, the reaction mass was cooled to 43 ° C 69g of dimethylethanolamine was added, after stirring for 23min, methyl ethyl ketone was removed under reduced pressure to obtain a modified urethane acrylate. 6. 42ppm、6. 65ppm、6. 93ppm。 6. 42ppm, 6. 65ppm, 6. 93ppm. 由此可见,所述改性聚氨酯丙烯酸酯为具有式（I)结构的改性聚氨酯丙烯酸酯，其中，R1为丙烯酸丙酯基，R2为六亚甲基，R3为二甲基乙醇胺基，η = 5，m=3。 Thus, the modified polyurethane acrylate modified polyurethane acrylates (I) having the structure of formula, wherein, Rl is the acrylate group, R2 is hexamethylene, R3 is dimethyl ethanolamine group, [eta] = 5, m = 3. 在干燥氮气保护下，向上述羟基丙烯酸树脂中加入360g丁酮、153gE44型双酚A环氧树脂、158g Y-环氧丙氧基丙基三甲氧基硅烷和O. Sg 二月桂酸二丁基锡，升温至77°C后加入527g甲基环己基二异氰酸酯，反应4h后，向反应混合物中加入182g甲基丙烯酸羟乙酯和O. 9g对羟基苯甲醚，继续反应5h后，将反应物料降温至45°C加入83g三乙醇胺，搅拌25min后，减压除去丁酮，得到改性聚氨酯丙烯酸酯。  under dry nitrogen, was added 360g methyl ethyl ketone, 153gE44 bisphenol A type epoxy resin, 158g Y- glycidoxypropyl trimethoxysilane and O. Sg dilaurate to said hydroxyl acrylic resin after dibutyltin temperature was raised to 77 ° C was added 527g methyl cyclohexyl diisocyanate, after 4h of reaction, 182g of hydroxyethyl methacrylate and O. 9g hydroxy anisole to the reaction mixture, the reaction was continued 5h, the the reaction mass was cooled to 45 ° C was added 83g triethanolamine, stirred 25min, methyl ethyl ketone was removed under reduced pressure to obtain a modified urethane acrylate. 6. 41ppm、7. 06ppm。 6. 41ppm, 7. 06ppm. 由此可见,所述改性聚氨酯丙烯酸酯为具有式（I)结构的改性聚氨酯丙烯酸酯，其中，R1为甲基丙烯酸乙酯基，R2为甲基环己基，R3为三乙醇胺基，η = 1，m = 3。 Thus, the modified polyurethane acrylate modified polyurethane acrylates (I) having the structure of formula, wherein, Rl is methyl methacrylate, ethyl group, R2 is a methyl cyclohexyl group, R3 is a group of triethanolamine, [eta] = 1, m = 3. 在干燥氮气保护下，向上述羟基丙烯酸酯聚合物中加入480g 丁酮、395gE31型双酚A环氧树脂、281g Y -环氧丙氧基丙基三甲氧基硅烷和2. Ig 二月桂酸二丁基锡，升温至79°C后加入653g2，4-甲苯二异氰酸酯，反应4h后，向反应混合物中加入318g甲基丙烯酸羟乙酯和I. 9g对羟基苯甲醚，继续反应4h后，将反应物料降温至42°C加入98g三乙胺，搅拌25min后，减压除去丁酮，得到改性聚氨酯丙烯酸酯。  under dry nitrogen, was added 480g methyl ethyl ketone, 395gE31 bisphenol A type epoxy resin, 281g Y to the hydroxyl acrylic polymer - glycidoxypropyl trimethoxy silane and 2. Ig two after the addition of dibutyl tin dilaurate was heated to 79 ° C 653g2,4- tolylene diisocyanate, 4h after the reaction, 318g of methacrylic acid was added to the reaction mixture and hydroxyethyl acrylate I. 9g hydroxy anisole, the reaction was continued 4h , the reaction mass was cooled to 42 ° C were added 98g of triethylamine, stirring for 25min, methyl ethyl ketone was removed under reduced pressure to obtain a modified urethane acrylate. 对所述改性聚氨酯丙烯酸酯进行核磁共振，其氢谱如下=1H NMR；1.06ppm,I. 26ppm、l. 35ppm、l. 68ppm、l. 91ppm、2. 21ppm、2. 43ppm、2. 65ppm、3.02 〜3. 68ppm、3. 98ppm、4. 15ppm、4. 38ppm、4. 62ppm、5. 88ppm、6. 07ppm、6. 40ppm、7. 03ppm、7. 38ppm0 由此可见，所述改性聚氨酯丙烯酸酯为具有式（I)结构的改性聚氨酯丙烯酸酯，其中，R1为甲基丙烯酸乙酯基，R2为甲苯基，R3为三乙胺基，η = 2，m = 3。  for the modified polyurethane acrylates nuclear magnetic resonance spectrum is as follows its hydrogen = 1H NMR; 1.06ppm, I 26ppm, l 35ppm, l 68ppm, l 91ppm, 2 21ppm, 2 43ppm,...... 2. 65ppm, 3.02 ~3. 68ppm, 3. 98ppm, 4. 15ppm, 4. 38ppm, 4. 62ppm, 5. 88ppm, 6. 07ppm, 6. 40ppm, 7. 03ppm, 7. 38ppm0 Thus, the said modified polyurethane acrylate modified polyurethane acrylates having the formula (I) configuration, wherein, Rl is methyl methacrylate, ethyl group, R2 is a tolyl group, R3 is triethylamino, η = 2, m = 3 . 将第一混合物和第二混合物混合，以700rpm〜900rpm的转速搅拌12min后，用200目滤网过滤，得到紫外光固化涂料，分别记为WP1、WP2、WP3、WP4、WP5、WP6和WP7。  The first mixture and the second mixture is mixed at a rotation speed of 700rpm~900rpm stirred 12min, filtered through a 200 mesh sieve, to obtain UV-curable coatings, are referred to as WP1, WP2, WP3, WP4, WP5, WP6 and WP7. 分别将WP1、WP2、WP3、WP4、WP5、WP6和WP7涂覆在马口铁片上，以3kW的紫外灯进行光固化，固化速度为20m/min〜25m/min,得到漆膜。  respectively WP1, WP2, WP3, WP4, WP5, WP6 and WP7 coated on a tinplate sheet, the UV lamp to 3kW of photocuring, the curing speed was 20m / min~25m / min, to give the film. 对所述漆膜进行性能测试，测试结果见表2，表2为本发明实施例提供的紫外光固化涂料的性能测试结果。  The paint film performance test, the test results in Table 2. 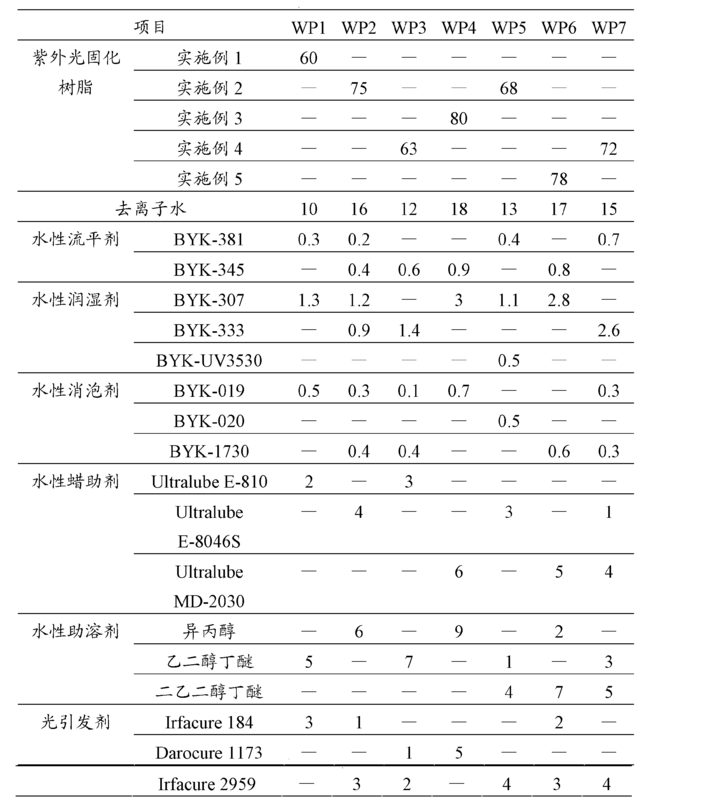 Table 2 Performance test results of UV-curable coatings according to an embodiment of the present invention. 耐盐雾性能的测试方法为：在盐雾环境中，200h不起泡、划线部分腐蚀< 2mm的为合格。 Test Method  salt spray resistance are: salt spray environment, 200H does not blister, corrosion underlined <2mm is acceptable. 由表2可知，本发明提供的紫外光固化涂料具有优异的耐指纹、防腐蚀、附着力等性能。  From Table 2, the present invention provides UV-curable coatings having excellent anti-fingerprint, anti-corrosion and adhesion properties. 由上述实施例可知，本发明提供的紫外光固化涂料不仅具有优异的耐指纹性能、防腐蚀性能和耐候性能，还能够快速固化，涂覆于板材表面后得到的漆膜无需烘烤，在紫外光的照射下即可以15m/min〜25m/min的速度固化,能够满足快速流水线涂装的需要。  apparent from the above embodiment, the present invention provides UV-curable coatings not only excellent anti-fingerprint property, corrosion resistance and weather resistance, fast curing is also possible, resulting in the coated plate after baking without surface coating , i.e., the speed can be cured by irradiation with ultraviolet light 15m / min~25m / min, to meet the need for rapid pipeline coating. 以上实施例的说明只是用于帮助理解本发明的方法及其核心思想。 DESCRIPTION  the above embodiment is for the purpose to help understanding the method and core ideas of the present invention. 应当指出，对于本技术领域的普通技术人员来说，在不脱离本发明原理的前提下，还可以对本发明进行若干改进和修饰，这些改进和修饰也落入本发明权利要求的保护范围内。 It should be noted that those of ordinary skill in the art, in the present invention without departing from the principles of the premise, may also be a number of modifications and improvements of the present invention, and these improvements and modifications also fall within the scope of the claims of the invention. 其中，R1为丙烯酸酯基； R2为异佛尔酮基、己基、甲基环己基、二环己基甲基或甲苯基； R3为叔胺基； m和η为聚合度，2彡m彡5，1彡η彡5。 Wherein, Rl is an acrylate group; R2 is isophorone group, a hexyl group, a cyclohexyl methyl group, dicyclohexyl methyl or tolyl; R3 is a tertiary amino group; m, and η is the degree of polymerization, 2 San San 5 m , η 1 San San 5. 其中，R1为丙烯酸酯基； R2为异佛尔酮基、己基、甲基环己基、二环己基甲基或甲苯基； R3为叔胺基； m和η为聚合度，2彡m彡5，1彡η彡5; 1(Γ18重量份的水； 0. 3^0. 9重量份的水性流平剂； 5、重量份的水性助溶剂； 2飞重量份的水性蜡助剂； 1. 3^3重量份的水性润湿剂； O. 5^0. 7重量份的水性消泡剂； 3飞重量份的光引发剂。 Wherein, Rl is an acrylate group; R2 is isophorone group, a hexyl group, a cyclohexyl methyl group, dicyclohexyl methyl or tolyl; R3 is a tertiary amino group; m, and η is the degree of polymerization, 2 San San 5 m , η 1 San San 5; 1 (Γ18 parts by weight of water;. 0.3 ^ 09 parts by weight of an aqueous leveling agent; 5, parts by weight of an aqueous co-solvent; 2 parts by weight of an aqueous wax additives fly; 1 3 ^ 3 parts by weight of the aqueous wetting agent;. ^ 5 to 07 parts by weight of an aqueous defoamer O.; 3 parts by weight of fly photoinitiator. 3.根据权利要求2所述的紫外光固化涂料，其特征在于，所述改性聚氨酯丙烯酸酯按照以下方法制备： 将羟基丙烯酸酯聚合物、Y-环氧丙氧基丙基三甲氧基硅烷、丁酮、环氧树脂、二月桂酸二丁基锡和二异氰酸酯混合，75°C〜80°C时发生反应，得到第一中间产物； 向所述第一中间产物中加入羟基丙烯酸酯单体和对羟基苯甲醚，继续反应，得到第二中间产物；40°C〜45°C时向所述第二中间产物中加入中和剂，搅拌中和后除去丁酮，得到改性聚氨酯丙烯酸酯，所述中和剂为叔胺。 UV curable coating material as claimed in claim 2, wherein the modified urethane acrylate was prepared in the following manner: The hydroxy acrylate polymer, Y- glycidoxypropyl trimethoxysilane , methyl ethyl ketone, epoxy resin, dibutyl tin dilaurate diisocyanate and mixing, the reaction occurs when the 75 ° C~80 ° C, to give a first intermediate product; hydroxy acrylate monomer is added to the first intermediate product and hydroxy anisole, the reaction was continued to give a second intermediate product; neutralizing agent is added to the second intermediate product when 40 ° C~45 ° C, and after removal of methyl ethyl ketone with stirring, to obtain a modified urethane acrylate the neutralizing agent is a tertiary amine. 4.根据权利要求3所述的紫外光固化涂料，其特征在于，所述羟基丙烯酸酯聚合物按照以下方法制备： 将甲基丙烯酸、丙烯酸羟乙酯、甲基丙烯酸甲酯、甲基丙烯酸环氧丙酯、过氧化苯甲酰和十二烷基硫醇混合均匀，得到混合物； 将所述混合物加入到100°C 〜130°C的有机溶剂中，反应3tT5h，得到羟基丙烯酸酯聚合物。 UV curable coating material as claimed in claim 3, wherein said hydroxy acrylate polymer was prepared in the following manner: methyl methacrylate, hydroxyethyl methacrylate, methyl methacrylate, methacrylic acid ring oxygen, propyl, benzoyl peroxide and dodecyl mercaptan uniformly mixed to obtain a mixture; the mixture was added to 100 ° C ~130 ° C in an organic solvent, the reaction 3tT5h, to give hydroxy acrylate polymer. 5.根据权利要求3所述的紫外光固化涂料，其特征在于，所述二异氰酸酯为异佛尔酮二异氰酸酯、六亚甲基二异氰酸酯、甲基环己基二异氰酸酯、二环己基甲烷二异氰酸酯或甲苯二异氰酸酯。 The UV-curable coating according to claim 3, wherein said diisocyanate is isophorone diisocyanate, hexamethylene diisocyanate, methylcyclohexyl diisocyanate, dicyclohexylmethane diisocyanate or toluene diisocyanate. 6.根据权利要求3所述的紫外光固化涂料，其特征在于，所述羟基丙烯酸酯单体为甲基丙烯酸羟乙酯、季戊四醇三丙烯酸酯或丙烯酸羟丙酯。 6. The UV-curable coatings according to claim 3, wherein said hydroxy acrylate monomer is hydroxyethyl methacrylate, pentaerythritol triacrylate or hydroxypropyl acrylate. 7.根据权利要求3所述的紫外光固化涂料，其特征在于，所述中和剂为三乙胺、二甲基乙醇胺、三乙醇胺或二乙醇胺。 7. The UV-curable coatings according to claim 3, wherein the neutralizing agent is triethylamine, dimethylethanolamine, triethanolamine or diethanolamine. 8.根据权利要求2所述的紫外光固化涂料，其特征在于，所述水性流平剂为丙烯酸酯流平剂或有机娃流平剂。 8. The UV-curable coatings according to claim 2, wherein said aqueous leveling agent, acrylate leveling agent, or a leveling agent, an organic baby. 9.根据权利要求2所述的紫外光固化涂料，其特征在于，所述水性助溶剂为异丙醇、乙二醇丁醚、二乙二醇丁醚、丙二醇丁醚、二丙二醇丁醚和丙二醇甲醚中的一种或多种。 9. The UV-curable coatings according to claim 2, wherein said co-solvent is aqueous isopropanol, ethylene glycol butyl ether, diethylene glycol butyl ether, propylene glycol butyl ether, dipropylene glycol butyl ether and one or more of propylene glycol methyl ether. 10.根据权利要求2所述的紫外光固化涂料，其特征在于，所述光引发剂为I-羟基-环己烷基-苯基酮、2-羟基-甲基苯基丙烷-I-酮、2-甲基-2-(4-吗啉基）-1-[4-(甲硫基)苯基]-I-丙酮、2，4，6-三甲基苯甲酰基-二苯基氧化膦、2，4，6-三甲基苯甲酰基苯基膦酸乙酯、2- 二甲氨基-2-苄基-l-[4-(4-吗啉基)苯基]-1_ 丁酮、2-羟基-2-甲基-l-[4-(2-羟基乙氧基）苯基]-I-丙酮或苯甲酰甲酸甲酯。 10. The UV-curable coatings according to claim 2, wherein the photoinitiator is I- hydroxy - cyclohexyl - phenyl ketone, 2-hydroxy - propane -I- methylphenyl ketone 2-methyl-2- (4-morpholinyl) -1- [4- (methylthio) phenyl] -I- acetone, 2,4,6-trimethyl benzoyl - diphenyl phosphine oxide, 2,4,6-trimethylbenzoyl phenyl phosphine, ethyl, 2-dimethylamino-2-benzyl--l- [4- (4- morpholinyl) phenyl] -1_ butanone, 2-methyl--l- [4- (2- hydroxyethoxy) phenyl] -I- benzoyl acetone or methyl.